Happy Free Book Friday! First, congratulations to the RRHS Library Staff (@rrhslib), who’s won Luis Paints the World. Send the address to publicity@lernerbooks.com and we’ll get your book in the mail. It’s time for the Mallory edition of Free Book Friday. Laurie Friedman’s popular Mallory series features Mallory McDonald, a spunky, energetic grade schooler whose stories are perfect for early chapter-book readers. #24 Change Is in the Air, Mallory has just been released, and here’s your chance to enter to win a free copy! The summer is off to a shaky start. Mallory’s best friends and next-door neighbors are moving. Her other nearby friend will be gone the whole summer. And her cat, Cheeseburger, is sick! Will Mallory’s bad luck turn around? 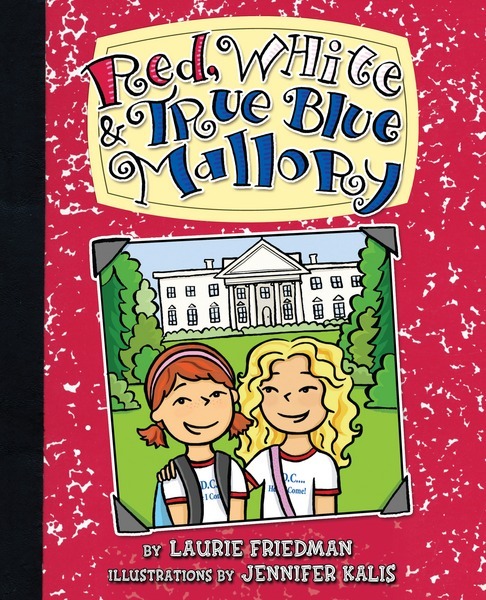 Plus, in honor of the upcoming election, we’ll throw in a copy of #11 Red, White & True Blue Mallory as well. Mallory is in Washington, D.C., with her fourth grade class. But Mary Ann is spending all her time with the new boy. Will this trip turn out to be one Mallory would rather forget? We’ll announce the winner on the blog on Friday, June 3. Good luck! Our family has enjoyed the Mallory series and I would love to see the new book!